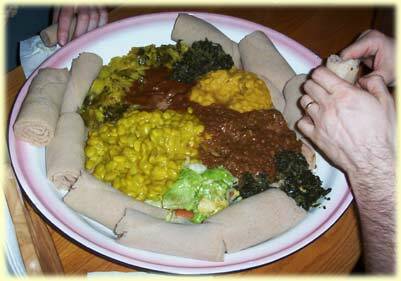 Altu&#039;s Ethiopian Cuisine | What Is Ethiopian Food Like? Traditionally, Ethiopian food is served family-style, on a platter. Each person breaks off a small piece of the spongy traditional flat bread and uses it to scoop up the stew, rather than using a fork or spoon. If you prefer, you may order your meal served one plate per person. You may also order it on a bed of rice rather than bread. It will then be served with silverware.